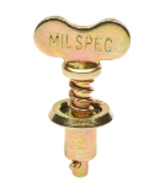 These Fixed Wing Head studs do not require tools to lock and unlock making them very convenient for panels that are accessed frequently. They are DFARS compliant steel with a bright zinc and yellow (gold) chromate finish. Steel parts can also be painted to match your paint scheme if desired. Additional lengths and other finishes are available upon request (minimums may apply). This drawing is for reference only. The chart below has the stud dash number in the far left column. This is the number that is stamped in the head of the stud. 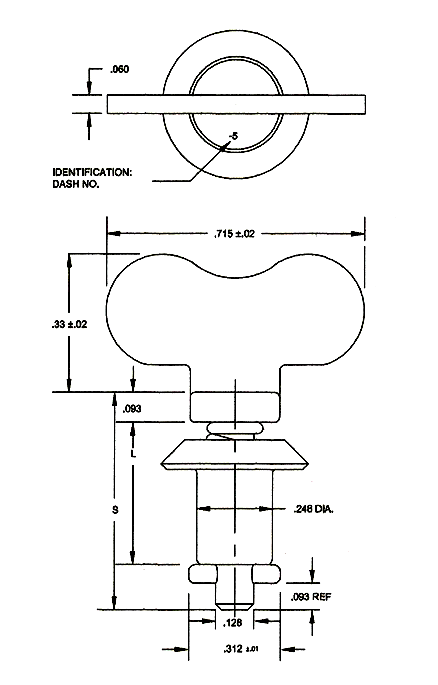 The two middle columns show the Total Material Thickness range (TMT) of each stud length when using Fixed depth or Adjustable depth receptacles. 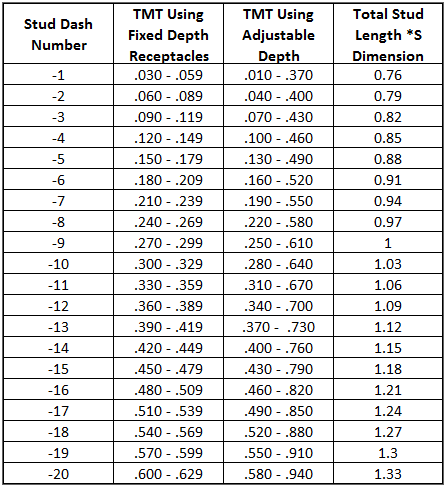 The far right column shows the S dimension for each dash number so you can easily measure and replace an existing stud. All dimensions are in inches. For metric conversion, use this formula: Inches x 25.4 = mm. mm ÷ 25.4 = Inches. If you have any questions or need anything else, please Contact Us. We will be glad to help.